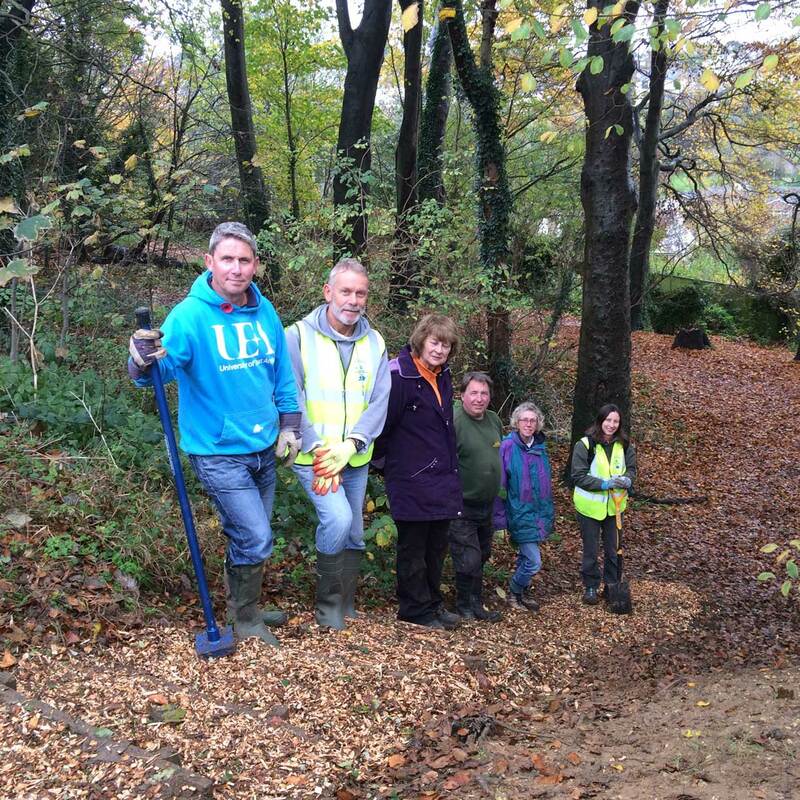 In spite of a less-than-promising weather forecast, on our last Saturday work day, six of our hardy volunteers bent their efforts on repairing the steps that lead from the Woodland Avenue snicket down the steepest part of the woodland shelf into Three Cornered Copse. This brought back memories of six years ago, when the friends group was newly formed, and we built the steps in the first place. But several years' usage and weather erosion had taken away a few of the retaining planks; the steps had started to return to the slope which was there in the first place. A few hours later, refreshed with tea, biscuits, and mince pies, and the steps are returned to their former glory. The recent days have seen the temperature drop to a respectable winter level, which may have been enough to end the growing season. Plants stop growing when we have five consecutive days below 5 degrees centigrade, and re-start growing when they sense five days above 5 degrees. The UK Met Office announced last year that the growing season is around a month longer than it was in 1961-1990. For the UK, the growing season is longer in the warmer parts of the country, such as south-west England, and shorter in the chillier areas of northern England and Scotland. Here in Sussex we're still mowing our lawns well into the end of November these days. The coldest winter in recent years was 2009-10, when the copse was covered in snow for several weeks. The Met Office announced it was the coldest winter for 30 years. (Caused by the combined effect of a warm El Niño, and a negative phase of the North Atlantic Oscillation, apparently.) In extreme seasons like this the density of the vegetation in the copse, and the thick carpet of organic material, humus, serves as a shelter for the small mammals and amphibians that hide from the life-threatening frost. 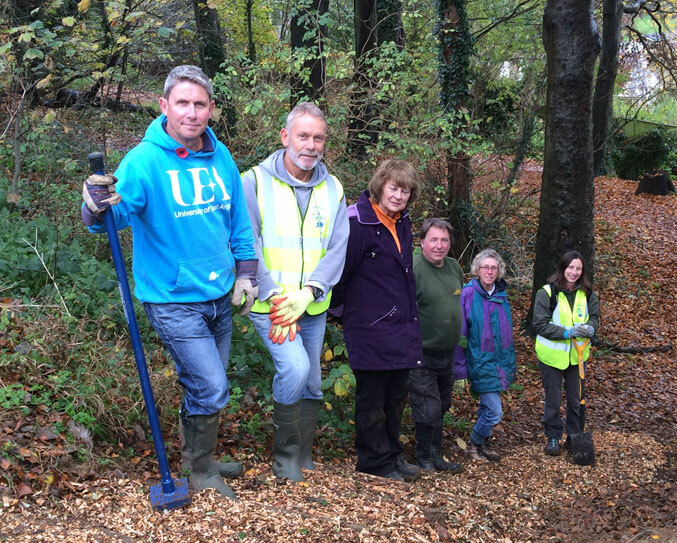 Last Saturday as we finished flattening woodchips into the newly restored steps, the sky grew dark and the heavy rain splashed through the trees, onto the golden carpet of leaves, and us. An early finish to our work day, for once. As we get into the wettest weeks of the year, the muddy paths in the copse become almost too difficult to negotiate, so take care if you venture out over the holidays. Have a peaceful Christmas, with best wishes from the Friends of Three Cornered Copse.